The Greenwood Corvette. At a time when the production Corvette was an anemic, EPA-choked European-wannabe sports car, John Greenwood took a 700hp big block and built Corvette-resembling race car around it. He got plenty of help from GM in turning already cartoonish C3s into even cartoonier race cars but he really did innovate aerodynamics at the GT level. His competitors copied wide-body styles in an attempt to catch up and now, years later, GT race cars are almost all exaggerations of their production versions. They are lightweight bodies dropped on top of purpose-built chassis. But that’s enough of a history lesson. If you really want more details, there is some good insight written by the recently deceased Mr. Greenwood at his website. 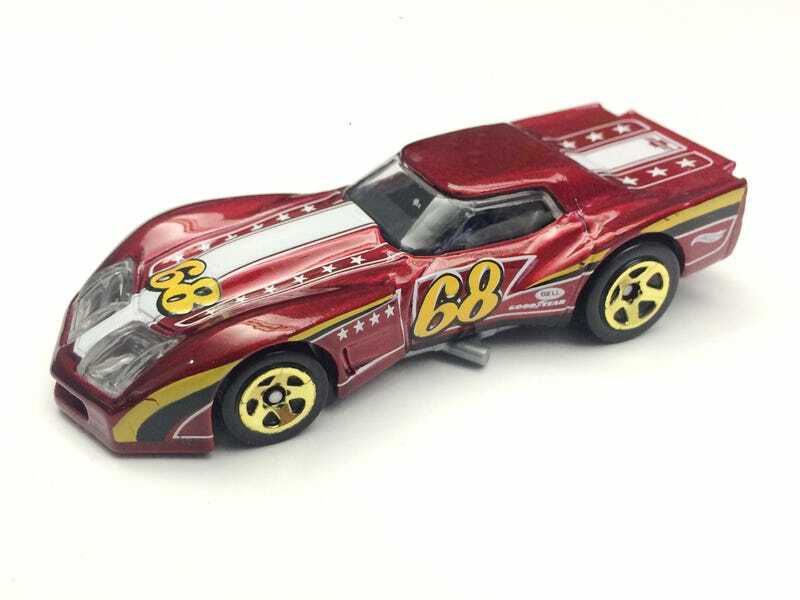 The Greenwood Corvette cast is one of my very favorite casts in the entire Hot Wheels line. My bias might be showing, but the only HW other cast that I think trumps it is the excellent Stingray Racer Concept Car. HW really put some effort into these casts and it shows. This particular cast is from the Mild to Wild series from this year’s mainlines. I’ve passed up many opportunities to buy this cast’s “Mild” version — the really quite bad Corvette Stingray cast — but I was happy to grab this one at the grocery store last night. The paint reminds me of the Regular TH Corvette Grand Sport that dropped this year. It’s a burgundy color with a slight hint of a gold-ish metal flake. However what I really appreciate on this cast is the tampo work. When a cast gets to its third or fourth release, it’s usually going to have some less-than-desirable tampo designs. This Greenwood Corvette actually looks like it could pass for a 1970s racer. In fact, here it is next to the reality-based Spirit of Sebring car. Tell me you couldn’t see these two duking it out at Daytona in 1976. At the end of the day it’s the little details that really make you appreciate a car and this Greenwood is no different. Check out the mostly-clean bowtie on the rear of the bodywork. HW released a Zamac version of the literally “Mild” Corvette Stingray cast and apparently a Zamac Greenwood is on the way in Batch G. It might have green glass, but I’ll definitely pick one up if I come across it.